Here were the vegetables in my bin. 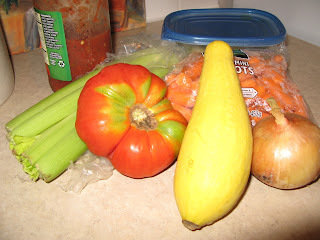 One tomato and squash left from the stash I got from my Dad’s garden last weekend. A lonely onion. Some slightly-on-the-edge of crisp celery, and baby carrots. Digging a little deeper, I find a container of cooked squash and onions left over from a night or so ago. I pull that out. Then I spy a half-full jar of salsa. Yep, won’t last until I get back, that’s going in the soup, too. I checked the pantry. 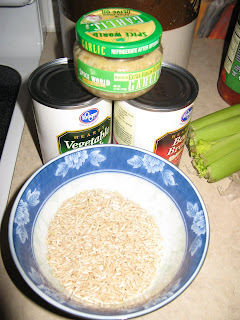 These things won’t go bad while but will nicely round out the soup—some brown rice, stock, and minced garlic from the fridge. With a layer of olive oil (which I also used the last of) in the soup pan, I sautéed the onions, celery, carrots and garlic, with some salt and pepper. About that time I remembered I had two small green peppers out on my patio garden, so I rushed out to get those. knowing that if we don’t get rain, they could wither on the plant before I get back. I also cut a couple of sprigs of flat-leafed parsley from my herb garden. Feeling accomplished (and glad my neighbor is not out for his first smoke of the day because I’m still in my nightgown…) I rush back to the soup. Everything else goes in the pot now. 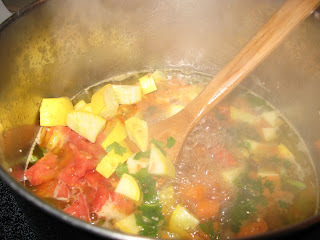 The diced green pepper (sautéd a little with the other veggies so they don’t feel singled out), then the stock (simmer), followed by the parsley, tomato, squash, the container of leftover squash (already nicely cooked) and the half jar of salsa. I looked at the brown rice and decided…just a little bit, about a quarter cup, because I didn’t want to over power the fresh veggies with a lot of heavy brown rice. We’ll see how that works. 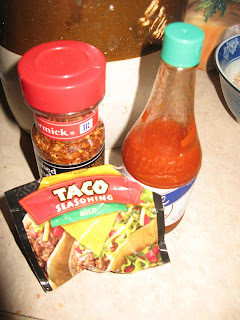 Since I was using the salsa, I decided to give this soup a little Mexican bent and added a dash or two of hot sauce, some red pepper flakes, and about a tablespoon of packaged taco seasoning. 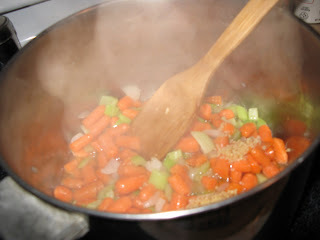 Now, bring to a boil again and then let simmer. Lid on, slightly cocked. And wait. So, from a few leftover veggies, some staples I always keep on hand in the pantry, and a some nice touches from my backyard patio garden, I’ve got soup. I’ll have a bowl for lunch, maybe dinner, and freeze the rest for a nice winter’s treat. And I have to say, that ain’t half bad. Actually, it’s Half-Scratched! Well, I’m often not that kinda cook, because that’s the beauty of Half-Scratched cooking—often you take what you have and make it work! By the way, after the vegetables in this soup sat around and mingled for a while, I have deemed it excellent. Let these guys hang out together for a while and cook down, med high heat. I always look for the onions to get translucent. My Mama told me that once. It works. Two cans of stock. I used one of beef and one of vegetable, because that’s what I had. Bring to a boil. About a tablespoon or so, I’d say, of taco seasoning mix. Bring to a boil. Add the ¼ cup or so of rice. Lower, cover, and simmer. Don’t let it cook to where the vegetables are mush. Sometimes I turn the heat off after a little while and just let the pot sit on the stove. It will still cook. Just eyeball. Remember! You can always substitute other veggies. What’s in your fridge? Happy to accommodate and I’ll do better by ya in the future. Great post, Maddie! 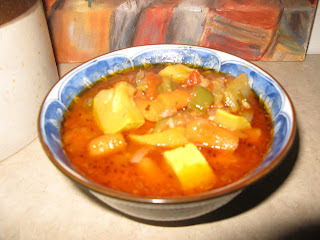 Heating that yummy soup from the freezer next winter is one of the best parts! Oh, I know! I'm very much a soup girl and fall/winter is the best time. I was able to freeze three containers which are just right for individual servings. Will make a nice lunch to take to work one of these days.